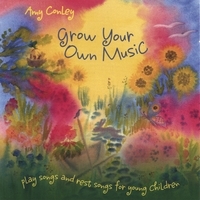 Grow Your Own Music is Amy's first recording, containing songs for play time and rest time. These delightful fingerplays, dances and lullabies are performed on gentle folk instruments including guitar, banjo, hammered dulcimer, penny whistle, harmonica and concertina. Amy's soothing voice and fun sound effects add to the magic of these easy-to-learn folk songs.